As the summer vibes tun up, Chant Down turns on the musical heat once again for More Fire – Australia’s longest running reggae session. 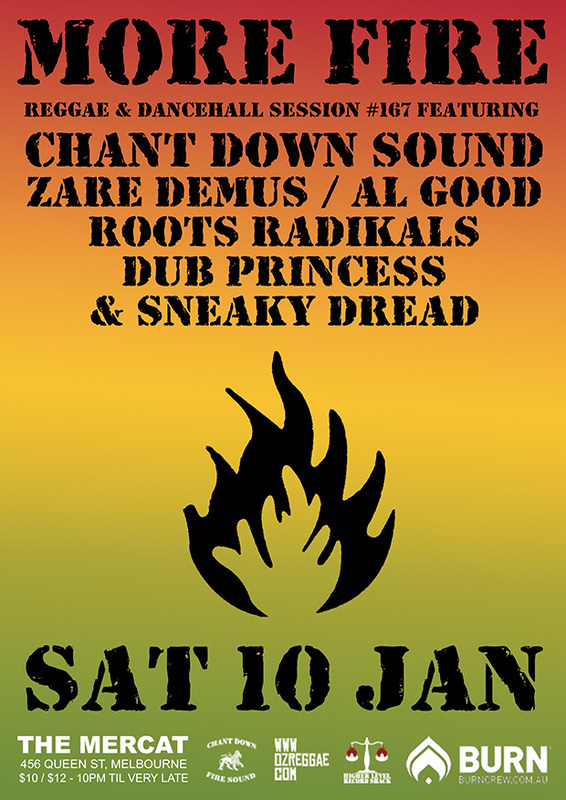 Residents Jesse I and Ras Crucial will be joined in January by guest selectors Zare Demus (Australia Reggae Radio), Roots Radikals (System Unknown Soundsystem) and Al Good – plus guest vocals from Dub Princess & Sneaky Dread. All styles of reggae and dancehall till early morning – more fire!! More Fire # 167 takes place on Saturday 10th January at Deep 11 (Mercat Cross Hotel basement, 456 Queen St, Melbourne). Doors open at 10pm, with a cover of $12 or $10 for concession holders, and PBS FM members.